What to Do in Birmingham in December 2018 | Infomedia, Inc. Although the weather outside may be frightful, that shouldn’t stop you from getting out and seeing Birmingham’s best events this December. Celebrate your fascination with felines at this cat-centric arts and crafts show. Hosted by Black Market Grill, the event will feature vendors with various goods for sale, live music by Margaux and the Cats Meow and a $5 door cover that will be directly donated to the Alabama Animal Adoption Society. If you’re still rounding out your Christmas gift list, the Birmingham Art Crawl is a great place to find unique items for that person for who has everything. The crawl will spotlight over 30 Birmingham artists, ranging in mediums from stained glass to oil paintings and printmaking. Celebrate Christmas with the community at the semi-annual CahaBAZAAR Holiday Market. A collaboration of Cahaba Brewing Company and Yellowhammer Creative, the market will host tables featuring local artists, craftspeople and non-profits. Grab a pint of beer and peruse the products, swing by Santa’s area where you can get holiday photos taken or enjoy some fine offerings from food trucks. Come party with AAF Birmingham at Uptick Marketing for their annual holiday celebration. The night will include food, drinks, a silent auction and networking opportunities with marketers from across the city. The organization will also be giving back by accepting donations for the Firehouse Shelter at the event. See the Birmingham Zoo in a whole new light, literally, this holiday season. The area will be decorated with beautiful illuminations, sparkling lights and a 30 foot tall Christmas tree. Other entertainment can be enjoyed with seasonal music, crafting stations, holiday themed games and more. Spend Saturday morning with Santa, and some cute animals, at Oak Mountain State Farm. Get your picture taken with Santa, enjoy some sweet treats and “adopt” a furry friend by donating to their wish list. Don’t forget to treat yourself on National Chocolate Covered Anything Day. Whip up some sweet homemade goodies, or visit one of our favorite dessert places in Birmingham like Chocolata or Honeycreeper Chocolate. Encourage the young women in your life to love computer science by taking them to Girls Who Code at the Homewood Public Library. Geared towards girls in the 6th-12th grades, the free class will cover the basics of coding. Bringing your own laptop is suggested, but not required. Watch the Alabama Ballet’s rendition of The Nutcracker at Samford University’s Wright Center. This holiday classic will be performed live to beloved music that sets the stage for a magical night. Attend the 13th edition of the Birmingham Bowl this month to take part in a classic Magic City event. The game brings together some of the best football players in the country, eager to showcase their talent and take home the win. Spend Christmas celebrating in your favorite way, whether that’s opening presents with your family, volunteering for the afternoon or snuggling up by the fire with some hot cocoa. What better way to ring in the new year by celebrating decades past? Workplay is hosting the New Year’s Eve ’80s Ball, featuring the M80s. Enjoy live music, food, drink specials and celebrate the stroke of midnight in your best leg warmers. Can’t keep up with all the events in Birmingham? 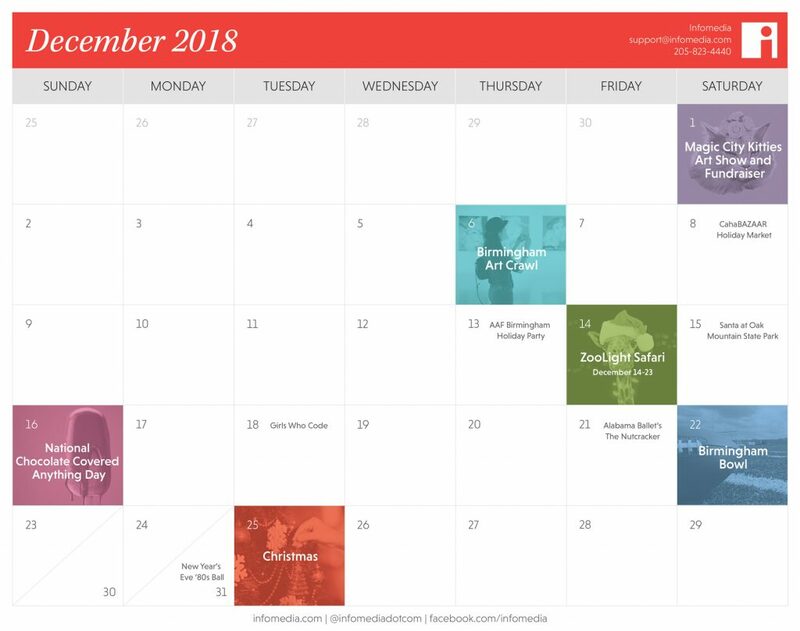 Then download our free December 2018 calendar so you never miss one.